Welcome to The July Helmar Challenge! This one will be a fun one....Open to interpretation- all you have to do is find something within the image which inspires you with your choice of project.....maybe its the fonts used, or the colours, maybe its the title or the topic, maybe its the design which gets you thinking about something creative.....just let the image speak to you and see what happens! I had a bit of fun playing in my art journal. You can see where I got my inspiration....The image above talks about what you could do with an extra two hours....I liked the green and red in the picture, so that made its way onto my page too. I tried something new here. I used Helmar Premium craft glue held above the page from a distance and let it drizzle all over my page creating a string like effect all over the background of my page. I used Helmar Two Step Crackle Medium here and there and heated it with the heat gun. It created bubbles and texture.....More cool stuff. So what does this inspiration image say to you? Just load your completed project to the Helmar Flickr page (http://www.flickr.com/photos/helmarlive/) and add your details- before the end of the month, (Be sure to tell us what Helmar glue featured predominately in your creation) for your chance to win a fabulous Helmar goodie pack! "You gotta be in it to win it".....so get creating!!!! When the sun starts shining how fun is it to make a new necklace that you can wear with a cute summer skirt. That is what I had fun doing this week with some Helmar's 450 Quick Dry Adhesive, a Shape Studio Tool from Epiphany Crafts, and some paper from Susan K. Weckesser Inc.
After cutting some of the paper in the Epiphany tool I used some SMOOCH from Clearsnap to edge and color of the paper shape. Using enamel white paint I covered three metal charms from Epiphany Crafts. Then by rubbing Molasses SMOOCH by Clearsnap onto the charms I was able to achieve an aged look. It almost looks like ceramic now. With my Helmar 450 QUick Dry Adhesive I glued my paper shapes that have the Bubble Cap Square tops by Epiphany on top of them into the metalk charms. I then took some ribbon and attched the charms to it. It will put a smile on your face! Helmar and Epiphany Crafts are Super Stars! Hey sticky friends! Cindy here sharing a card made with Helmar products and the Epiphany Crafts Shape Studio Star Tool #25 along with the Star Bubble Caps during our two week cross promotion with Epiphany Crafts. I started with a 6 x 6 card base. 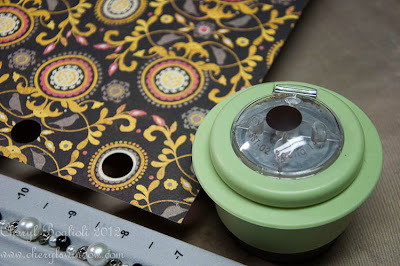 I then assembled my paper mats with Helmar Quick Fix Tape Runner in the centers to hold them in place so I could stitch around the edges, adhering the completed mats to the card front with Helmar Premium Craft Glue . The center mat is dry embossed with clouds, inked, and then a light layer of white gesso over it to tone down the color a bit. It’s then assembled in the same way as the card front mats and adhered to the card with white foam Zap Dots. I used my new Epiphany Star Tool to punch a few stars to scatter around the card front and then I used it to create the really awesome epoxy star. 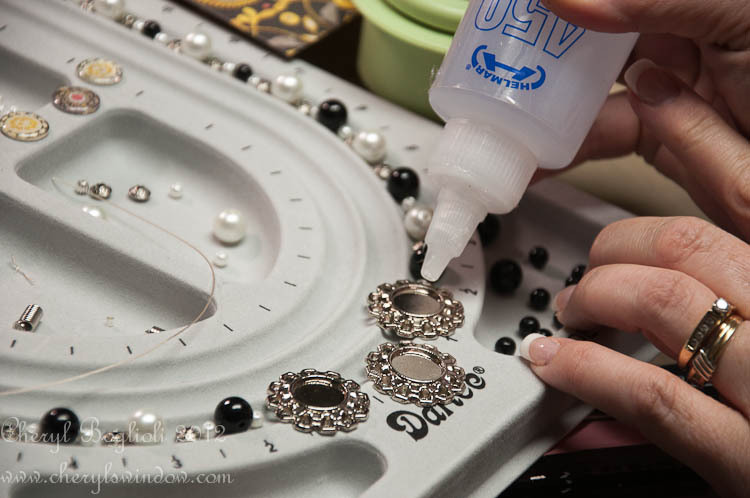 Epoxies are really fun embellishments. Customizing them to suit your project is really cool! I adhered the epoxy star to hover above my die cut star using Helmar Liquid Scrap Dots – great lift. I simply used a gel pen to write super and adhered it behind the hand cut Star banner. I also used the Epiphany Star Tool to punch a coordinating star on the inside pattern paper before adhering it, allowing the cardstock to show through. Helmar products and Epiphany Crafts are Super Stars!! Helmar Products: 450 Quick Dry, Zap Dots, Quick Fix Tape Runner, Liquid Scrap Dots, Acid Free Adhesive, Premium Craft Glue. Machines/Tools: Cricut Mini, Cuttlebug, Epiphany Crafts Shape Studio Star Tool #25 with Star Bubble Caps. Hello, Cheryl Boglioli, from Cheryl’s Window, here with another view from my studio today. 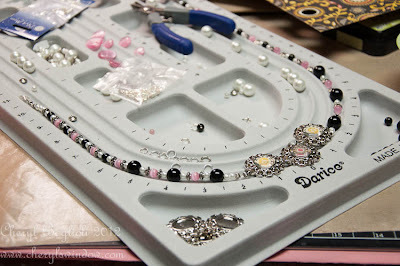 When I found out that I got to work with Epiphany Crafts charms, I decided I was going to play with jewelry. I’ve been dying to try my hand at making some of my own pieces and this was the perfect opportunity. I used some Authentique paper to punch some designs with the SST-02 Round 14 punch. It was a perfect fit. Helmar 450 adhered the epoxy inside the charms. You’ll notice that I changed my mind and swapped pink beads for the larger white pearls. Don’t the pink beads look even better with these charms? I strung the beads and added a lobster closure. I even finished some coordinating earrings to complete the set. I enjoyed learning how to properly string some beads and complete a jewelry piece I can actually wear. 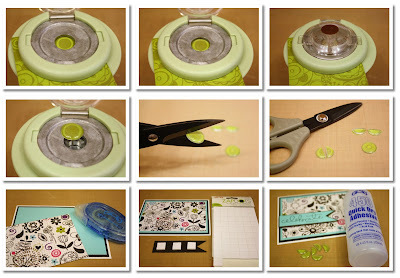 It was a lot of fun playing with the Epiphany Crafts punch and matching epoxy stickers. I’m truly eager to play with some more shapes. Make sure to follow along all week here at Helmar and over at Epiphany Crafts to see what Helmar and Epiphany can do together. Good Morning! It's Jamie and I am so happy that you are joining me today as Helmar and Epiphany Crafts are teaming up for a fabulous two weeks of amazing projects! Be sure to check both company blogs throughout the next two weeks, you are not going to want to miss this! 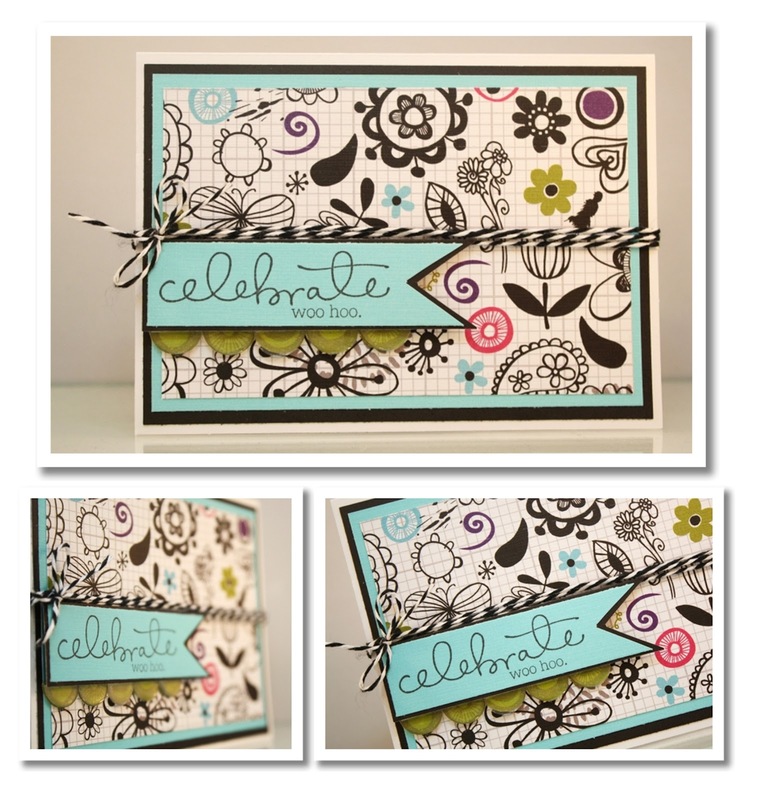 Today I have created a card using a variety of Helmar glues and Epiphany Crafts Round 14 tool and Bubble Caps! 1. Line your paper up in the Round 14 Tool. 2. Place a Bubble Cap over the paper in the hole. 3. Put in the insert piece and close the lid, then push to punch the paper (which also adheres the Bubble Cap)! 4. For my card, I created a scallop border underneath the sentiment banner. 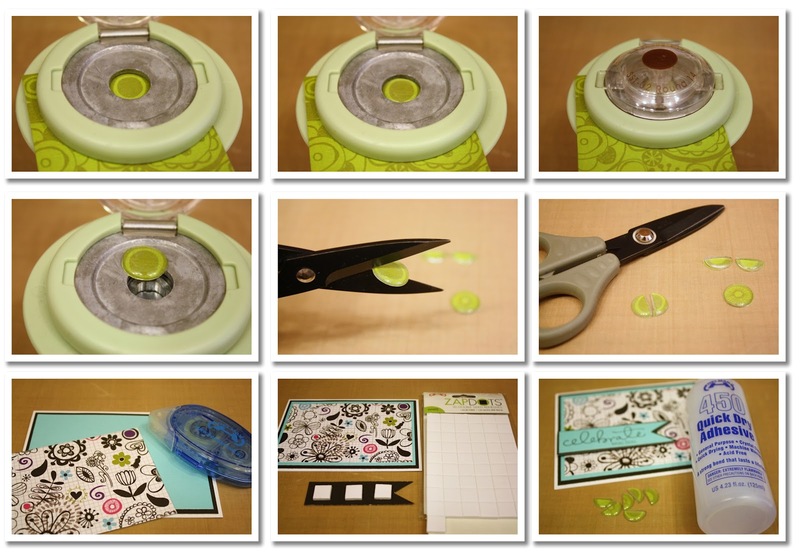 To do this, you will need to punch three circles (as shown in steps #1-#3) and then cut the Bubble Caps in half. 5. You can see two of the circles have been cut in half in this photo. 6. Cut and adhere your paper mats on to your card base using Helmar's Adhesive Runner. 7. 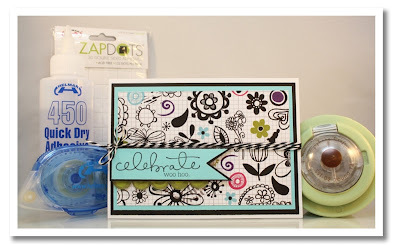 Place 1/2" White Zapdots on the back of the sentiment banner and then adhere to the left of the card. 8. Use Helmar 450 Quick Dry Adhesive to adhere the Bubble Caps under the sentiment banner. 9. Finish the card by adding in some twine! Be sure to check out Helmar and Epiphany Crafts for more projects over the next two weeks! here's the story: so...i get this shape studio tool pennant and i am all like..."hhhmmmm. what is this all about? couldn't i just use the bubble cap stickers on paper and then cut them myself??" the simple answer to that question is "hail no!" i tried it and failed miserably. when i used the shape studio tool, i instantly fell into "like" with it. it was a clean cut and SUPER SIMPLE to use. the more pennants i punched out (on the paper i chose to match), the more i was diggin' it. it did not take long for me to be in total LOVE with this cool tool! 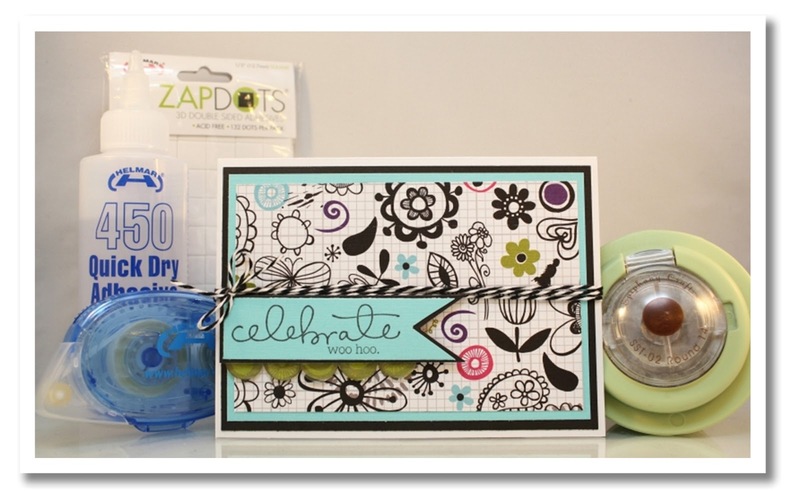 check out this page: cool tools from epiphany, for it is where i will be purchasing all sorts of other shapes! did you know you can make JEWELRY with PHOTOS?! shut up, it's true!! i used helmar's zapdots to make the bubble pennants stick. Hello Everyone and welcome to our first cross promotion of the season. We are absolutely elated to be working with our Preferred Partner Epiphany Crafts this term. Over the next 2 weeks, we will be showcasing how well Helmar and Epiphany Crafts work together and will have a few giveaways along the way. Make sure you also check out what is happening on the Epiphany Crafts Blog too. There is sure to be some amazing projects to oggle over. From Epiphany Crafts amazing Shape Studio Tools, to the most clever Embellishments, You are going to love all the projects that the Helmar Design Team share with you. We love our preferred partners and want to share with all of our fans, these wonderful Manufacturers. Hop over to the Epiphany Crafts facebook page and tell them Helmar sent ya. Good morning or afternoon or evening everyone!!! I can't work out these time zones - I think I am about 14 hours ahead of the States.... which makes it early Sunday morning for me here so I have grabbed my coffee and going to share my latest project! As I was going to play with some new oxides I kept the LO simple making the Twiddleybitz chipboard the highlight... As you may have gathered by now I love texture so I popped some on the windmill blades and the tree and allowed it to dry. This texture paste I added white sand to so it was quite gritty... Then I could start playing with these oxides... Have any of you ever played with them? I would love to know your feedback, tips and idea's!! I do think I have found another medium I love to play with!! Then I added some subtle stencilling with the honeycomb pattern and the barb wire to give it that old feel and added some chicken wire which I rusted around the photo. Basically I painted the chipboard silver first allowed it to dry then painted the Craft and Hobby glue over the top and sprinkled on the rusting powder before giving it a squirt of vinegar to make it rust! THen voila.... place the pieces add a title and it was done! Can't say my clean up of the kitchen bench is yet though!!! I do hope you enjoyed my LO today and as I said would love to hear your feedback on the oxides.... leave a message here or on my blog! Happy scrapping till next time. Hello Helmar fans! This week we are featuring male inspired projects. Below is my layout project using the awesome June Swirlydoos "Antiquities" kit - featuring the Bo Bunny Weekend Market collection and Simple Stories Awesome collection. This is my hubby and our first born. To this day... his daddy really is his hero. Can you believe I've had that Martha Stewart heart border punch since it arrived in my Christmas stocking and this is the first layout I've used it on? Shame on me! I put this layout together using Helmar Premium Craft Glue for the paper layers (all distressed with my Zutter distrezz-it-all). I glued the Dusty Attic chipboard (from my shop) and gorgeous Kaisercraft flowers on with my favorite Helmar 450 quick dry and I used the Acid free glue for the picture. I used some black Helmar foam ZapDots to give the titles some dimension. I am bringing you today the first project instalment for "A Happy Helmar House" in these posts you will see projects that you can do in your home to help organize, decorate and fix items. It may be holiday decor or even what your seeing today. Where I have revamped the storage in my coat closet into a happy Helmar space. Our coat closet goes under our stairs and has lots of extra storage. We moved the bar that was only a few feet into the closet to he back so that we could access the entire space. Previously we had hats and mittens and scarves tossed up onto this shelf with no organization and things were falling all the time and mittens were getting lost etc. A trip to Biglots saved the day with some inexpensive plastic buckets. This is the end result. These are the buckets from Biglots... snooze... boring! So lets make this a Happy Helmar space! I took the boxes and traced the side pattern on the back side of each of the pages I was wanting to use to spruce up the space. Once traced and cut out I used Helmar Silicone Adhesive Sealant to adhere the paper to the plastic box front. I used the Helmar spreader to evenly spread and thin out the Helmar Silicone Adhesive Sealant. Though this takes some time to dry I felt it was best for this application due to the plastic of the boxes. Once they were covered I labeled them each with names so we knew what or rather who's stuff was inside. These labels were embossed chipboard and some Helmar Acid Free Glue to adhere it all together. Also inside this closed were some pinwheels left over from my sister's wedding photo backdrop. I took them and pinned them to the walls and they also were made with some folded paper and Helmar Acid Free Glue. I hope you all enjoyed this blog post as much as we are enjoying this new space! What do you use Helmar on to make your home A Happy Helmar Home? Leave a comment below. Thank you!